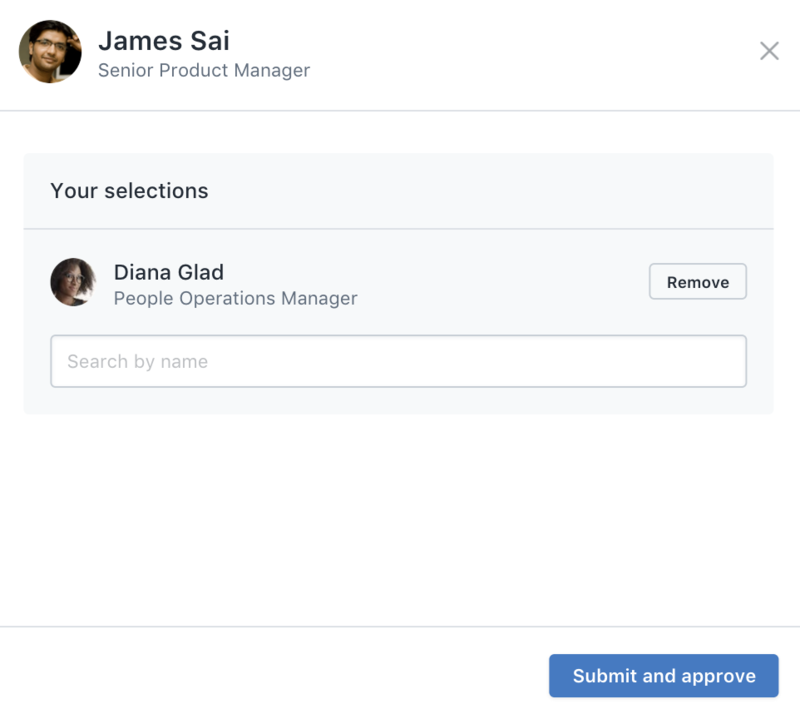 As a manager, depending on the peer selection settings chosen by your admins, you will either be selecting peers for your direct reports or approving the peers whom your direct reports nominated to review them. If this is the setting for the review cycle, you will be in charge of selecting who will be doing the peer reviews of your direct reports. Upon entering peer selection, you will be prompted to choose peers for your direct reports. You can do this by clicking "Nominate" to the right of the direct reports name. You'll type in who you want to peer review your direct report and then click "Submit and approve." After completion, instead of saying "Not Started", it will say "Nominated" in green (shown below). As long as the review cycle is in the nominate peers stage, you can change or add to your direct report's peer nominations. In this situation, your direct reports will first nominate who they would like to have reviewing them as a peer. After they are completed, you will have the action to either confirm or override and change their choices. Upon entering peer selection, you will be prompted to confirm the peers chosen by your direct reports. 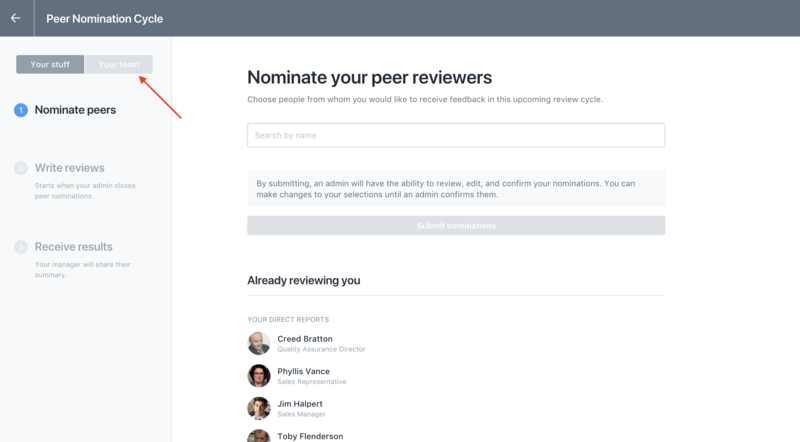 You can do this by clicking into the Task "Select peer reviewers," then choose "Your Team." 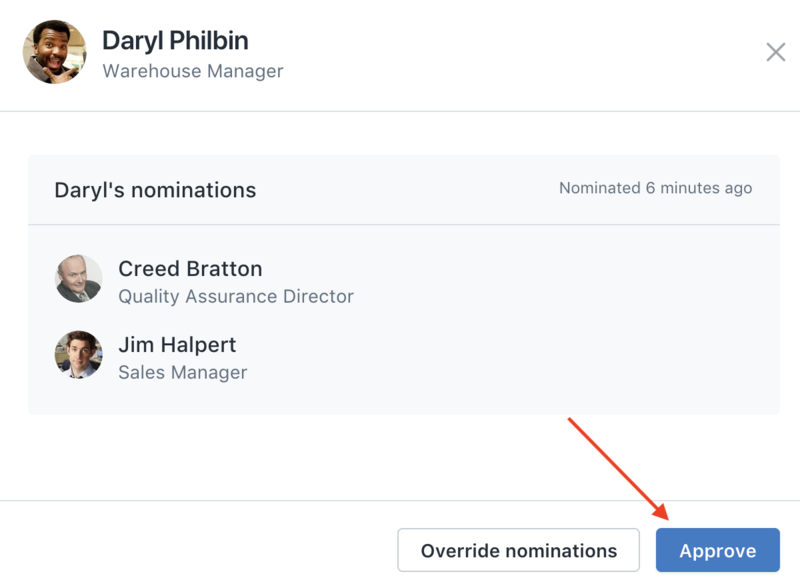 Once on the Your team nomination page, you can 1) Remind your direct reports to nominate peers, 2) Override their choices, or 3) Manage and approve their choices.